NOTE: For a follow-up on the research in this post, see this post with research commissioned by a group of Music Row leaders. It’s easy to understand the resulting disbelief and outrage – Hill’s advocacy for a rigged game that limits women to a low ceiling of 1/8 of station playlists, regardless of song, offends the basic principle of equal opportunity. We were already well aware of the gender imbalance at country radio, but as noted here & elsewhere, the conscious and deliberate imposition of systemic barriers to female airplay adds an unconscionable level of artifice and engineering to the game. That the recommendation for those barriers comes in a time when women have been making much of the most acclaimed and defining music in the genre while country radio’s most dominant male acts have come under criticism for the formulaic sameness of their music, and in a time when several women are outperforming male counterparts with more radio exposure, only makes Hill’s recommendation more tone deaf and strange. But for the sake of discussion, let’s accept the idea that radio is not in the fairness business or in the business of supporting quality music and artists, and let’s indulge Hill’s belief that this means radio shouldn’t even try. Let’s also go along with the idea that country radio must be self-interested in its quest for advertising dollars. Two cornerstones of Hill’s argument are that country radio should accept and cater to the “expectation” that it is “principally a male format with a smaller female component” and that “women like male artists.” Upon closer evaluation, the data associated with each point does not support his recommendation for a 13% limit on females on country radio. The table above suggests that while current female representation in the t10 is within historical range, female representation in the t25 has dipped in the past 2 years. We also see that the lull is not unprecedented – for example, the early June 2003 chart reflected a similar result, perhaps the by-product of country radio’s removal of the Dixie Chicks from its playlists after “The Incident” (in March 2003). On the other hand, there have been better times for females. The 9/25/1999 chart featured a t10 with 5 solo female acts and an all-female group (60%) and a t25 with 6 solo female acts and 2 all-female groups (32%). There seems to be an outer limit where females are not likely to comprise more than 1/3 of the t25 of the airplay chart (33% female representation on the country charts would put the country format in line with the CHR/Top-40 and AC formats according to Aircheck’s Women In Country issue). But the above table suggests that periods on country radio where there is 1 female voice represented for every 7-9 males, as is the case on the current chart, are atypical. Averaging female representation in the t25 for these 20 charts, it would appear the historical “expectation” for female representation would be closer to 1 female act for every 3-4 male acts played (20-25% representation). This result mirrors the findings of Country Aircheck’s study of the percentage of female voiced singles in the annual Top 100 Songs Of The Year since 1989. Balanced? No. But better than what Hill recommends. Further, the fact that country radio has sustained charts with even higher female representation suggest that there is nothing fundamental about the country radio audience’s taste that would make it unwilling to support female voices in greater proportion than country radio currently offers it. And a deeper dive into the issue of taste shows that Hill’s assessment of the gender dynamic is off-base. When they vote about the music they want to hear on the radio, when asked when they hear the hooks, they seem to prefer the music from male artists. It is a fine difference to say whether they prefer men or women, but overwhelming they vote for songs by men. The current terms of the debate imply that the feedback radio gets is binary, an up-down vote on female acts versus male acts. But it is not, and that is what accounts for the differing assessments on the response of radio listeners to the music on radio. Playlist rotation decisions generally rely on “research” or callout designed to assess listener response to current singles. Most song research involves playing hooks of 15-45 seconds in length for either a self-selected or randomly sampled group of listeners who then indicate whether they are familiar with a song, rate the song on a scale of 1 to 5, and then say whether or not they are tired of the song. Results get aggregated for radio, and programmers can break down the resulting data by demographic and see trends. Respondents typically self-identify as committed radio listeners, which means an inherent familiarity with, and therefore bias towards, the status quo. Familiarity impacts individual songs, too, as songs typically research better as they become more familiar for the audience. With all that in mind, using the generally positive callout from female listeners for current hit songs as an endorsement of country radio’s gender imbalance as Helton does is a leap. Listeners can only rate what is tested, it is typically only songs in or approaching the t30 or t40 that get tested, and the familiarity advantage favors established hitmakers and songs that sound similar to past hits. With female voices a rarity on radio playlists, they are inherently less familiar and thus more likely to score high negatives. That creates a chicken-egg problem for new female acts looking to break out: it is harder to test well early, and if they don’t test well early, stations are less likely to move them up into significant rotation. So even if female listeners are satisfied enough with the current mix of hits on country radio, it doesn’t follow that they wouldn’t support greater gender balance. In fact, current callout suggests that females do support greater gender balance than their male counterparts, and directly refutes assertions that female country listeners don’t want to hear female acts. Here, we take at a look at current callout data in two ways. First, we look at the t10 ranked songs by gender, based on a few different representations of favorable response, and then we look specifically at the female songs being tested to see how female listeners rated them compared to male listeners, using both favorable and unfavorable responses. The callout data comes from 2 national services that use panels of randomly sampled listeners: Critical Mass Media and Callout America. Here is the composition of the t10 songs ranked by “pop score” and by the percentage of people who consider the song a favorite, for men & women in the current Critical Mass Media callout survey for current singles at country radio. 7 of the 38 singles that appear in the survey have lead female voices. All respondents were between the ages of 25 and 44. Out of the 7 songs female-led singles tested, females surveyed rank 3 in their t10 by Pop Score, and 3 in their t10 by Favorite (30%). That’s nearly 43% of the female-led songs tested in the t10 of female listeners, despite the fact that female-led songs comprise only 18% of the sample. Notably, 1 of the female-led singles scoring the highest Favorite mark among female listeners (Kacey Musgraves’s “Biscuits”) hasn’t even made the t40 at country radio. Males surveyed, on the other hand, ranked none in their t10 by Pop Score (the highest ranked female-led single is at #18), and 1 in their t10 by Favorite. Now, a similar look at the current Callout America results, with the t10 songs for each gender ranked by Total Positive response (the percentage of people giving the song a favorable score), Positive Index (the average rating for the song), and Favorite (the percentage of people giving the song the highest possible score). There are 6 female-led songs in the sample. All respondents were between the age of 18 and 54. Here, females show particularly high support for 2 out of the 6 female-led songs (33%), 1 of which is a t5 hit but 1 which has yet to make the t25 on the airplay charts. By the “Favorite” metric, females add a 3rd female-led song to their t10. Female-led songs represent 17% of the songs tested, but 20% of the female listener t10 by Positive Index and Total Positive and 30% of the female listener t10 by Favorite. Meanwhile, none of the 6 female-led songs factors into the male listener t10s by any metric. Some female-led singles do score relatively high negatives among female listeners too, though the singles from Kelsea Ballerini, Maddie & Tae, and Mickey Guyton run middle of the pack on that metric and the percentage of female listeners who rate the female-led singles negatively is lower than that of male listeners. Female listeners also offset that with high favorite rankings for 4 out of the 7 female-led singles, something we don’t see among male listeners. As is the case with male listeners surveyed by Critical Mass Media, all 6 female-led singles are among the songs garnering the highest percentage of unfavorable responses, and there are no offsets in the positive response categories. It is potentially interesting (and perhaps indicative of why she’s been able to succeed with her current single as a new female act on an indie label) that Kelsea Ballerini’s callout tracks pretty closely among male and female listeners, which results in a relatively high ranking for her single among male listeners (compared to other female-led singles) but a relatively low ranking among female listeners (especially in light of her current t10 airplay chart position). Here again, we see female listeners rate every female-led single other than Kelsea Ballerini’s higher in every favorable category than male listeners, with lower negatives for most of the female-led singles, as well, with a distribution of response that for the most part reflects each single’s airplay rankings. Maddie & Tae’s “Fly” is the major outlier among females, testing well ahead of its current airplay ranking, though that is offset in the overall survey by especially negative ratings by male listeners. The above tables both illustrate the willingness of female listeners to sustain a higher representation of female-led songs in high rotation than the current airplay charts reflect and point to the likely hindrance, to the extent that radio programmers rely on listener feedback. And while the tables may only illustrate the response to current singles, the results are typical. Our data-based look into what was holding Little Big Town’s “Girl Crush” back at country radio a couple months ago showed female listeners out in front on that song. Over the past few years, Critical Mass Media surveys have shown stronger, sometimes much stronger, ratings for Miranda Lambert’s “Little Red Wagon,” Carrie Underwood’s “Something In The Water,” RaeLynn’s “God Made Girls,” Miranda Lambert & Carrie Underwood’s “Somethin’ Bad,” Jana Kramer’s “Love,” Miranda Lambert’s “Automatic,” Sara Evans’s “Slow Me Down,” Danielle Bradbery’s “The Heart Of Dixie,” Cassadee Pope’s “Wasting All These Tears,” and Kacey Musgraves’s “Merry Go Round” (among other female-led singles) among female listeners responding than male listeners. It appears, as Jaye Albright noted, that male listeners consistently score female-led singles lower than female listeners, perhaps due to an inability/unwillingness to relate to the female points of view expressed. Female listeners may more easily overcome the familiarity gap because they relate to the perspective of the songs. The current representation of females in the t25 of the Billboard Country Airplay charts puts the country format down around where the rock format is, according to Country Aircheck. As previously noted, the comparison is apt because of the degree to which country radio’s ratings growth over the past few “bro country”-dominated years has been aimed at male former rock radio listeners. To return to the idea that country radio must act in its self-interest, rock radio and its ratings decline provide a potential cautionary tale. Not only did the last 6 months of 2014 show “record ratings” declines for country radio, but this graphic via Mike O’Malley’s blog shows country radio continuing its ratings decline in the adults 25-54 demo through March 2015, contrary to the annual Q1 growth pattern of 2013 and 2014. While country radio is obviously still doing very well in an absolute sense, many radio personnel seem to agree that doubling down on the “bro”mogeneity and aggravated imbalance of the past few years is not the way of the future. Callout shows the challenge of change, however. Country radio has spent the last few years catering narrowly to an audience with narrow taste. The familiarity factor is overwhelmingly tilted towards male acts at this time, so it’s no wonder that a consultant like Hill would expect tuneout in the event of more female airplay. To the extent that country radio programs in fear of tuneout, i.e., songs with higher negatives, female acts are bound to continue to be underrepresented on the format. But Little Big Town’s “Girl Crush” provides a valuable lesson. As a ballad with a suggestive lyric sung by a female, it was slow to develop at radio despite sales far ahead of its airplay, hence the eruption of controversy. But 9 weeks since the controversy, it sits just outside the t10 at country radio with 3 times more spins and 3 ½ times more audience impressions at country radio (according to the Billboard Country Airplay chart) than it had pre-controversy. Supported by strong passion and huge sales, both callout and airplay have improved, and the male demo in particular has come around on the song. This points to a development path for female-led singles going forward. Due to the familiarity gap, female singles may be slower to research out of the gate, but sticking with ones that show strong early passion and/or favorables (as the current singles from Mickey Guyton, Maddie & Tae, and Kacey Musgraves do depending on the survey consulted) can yield hits for radio in the end. “Anytime you take an art form and draw narrow lines around it, you are always wrong. You never look smart in the long run by saying female artists don’t test… Everybody needs to cool off and do their jobs. They will recognize talent when it walks through the door and there will be much celebration. These imaginary rules that have people laughing at us have got to stop. That Kacey Musgraves is just 1 example among several of female acts who have outsold their male peers despite having less airplay exposure further points to country radio being somewhat out of touch with the overall music market. During difficult times — like a recession, when staff is getting trimmed nationwide — falling back on research is a safe choice. Doing so removes culpability if ratings take a nosedive…No, no one is consciously not playing Jana Kramer because they’re afraid of getting fired, but the climate from 2008 to 2011 (and later, in some instances) made fear an engrained part of the culture. It was a bloodbath, especially within larger companies. It’s easy to understand why programmers quit taking risks. Country radio may not be in the business of maximizing record sales, but as Hill himself seems to concede when he brings up the desire of record labels to sell, the high passion levels in callout tend to correlate with strong fan investment and strong music sales, and those investment levels can also translate into listener loyalty to media that support the music they love. A lack of risk-taking may feel like the safest path, but as Hill himself concedes, it closes off potential growth paths for country radio. And that is why, as country radio looks for new audiences to offset recent declines, it would behoove programmers not to double down on artificial limits to female representation as Hill recommends, but to show more patience in developing female hits. 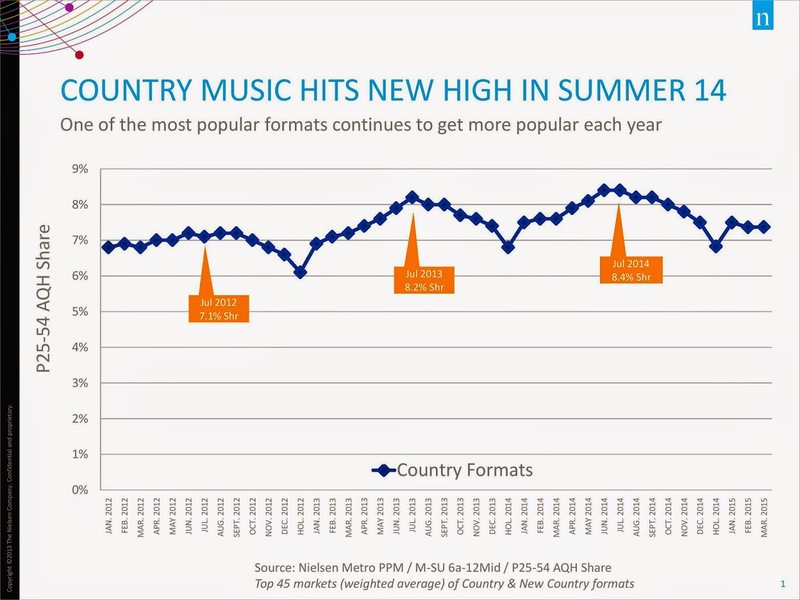 As CMT’s Brian Philips points out and as Kevin Coyne of Country Universe illustrates via sales data, doing so in the face of early high negatives can transform and drive growth for the genre in ways that benefit the very bottom line that country radio seeks to protect.